If you've got something like a Nesco with the stackable trays, you'll need to have a minimum of 4 trays on the dh even if there's nothing on them. Keep the full trays towards the middle. And you may have to move trays around to ensure even drying. Some dehydrators dry from the top down. Some bottom to top. And some back to front. (Read your owner's manual!) If you're buying a new dh, be sure to get adjustable temps. 1. Pick really nice produce. I DO use produce that is damaged. But I'm sure to cut out damaged parts with a wide margin around it. Just depends on nice how you want your finished product to be. 3. MOST veggies will need to be at least blanched. Mushrooms & onions & a few other items are exceptions. I'll get you a list. Remember that your re-hydrated items will re-hydrate back to where they stopped cooking. So if you're going to be using them in soups, crockpot meals, etc, that are long-term cooking, blanching will be fine as they'll continue to cook after re-hydration. I personally prefer to go ahead & cook mine. Just makes it easier in the long run for me. I haven't had an issue with items becoming mushy. 6. Plan on flipping your items over every 3-4 hours. This also is for even drying. 7. Time will depend on your local humidity. You're looking for about a 10% hydration rate with veggies, so crispy. Having said that, as Sanderson found out, onions won't get crisp. They will still be flexible. 8. Once you think they're done, your items will need to be "conditioned." Let them completely cool. Place in a bag or jar & set in a dark spot. Twice per day, shake the jar/bag. (This will allow any remaining moisture to distribute evenly among the items.) Look for ANY condensation on the bag/jar. If any is spotted, put the items back on the dh for a few hours. Rinse & repeat. Once you go a week to 10 days without any condensation found, they're ready for long-term storage. You can use O2 absorbers. (I don't & have never had a problem.) I would STRONGLY recommend using a vacuum sealer on either the jars or bags. Then store in a cool, dark place. The cooler & darker, the longer they will last. Be sure to label & date everything to allow for proper rotation. Okay, gotta go to work now... More later! @AtlantaMarie wrote: . . . 8. Once you think they're done, your items will need to be "conditioned." Let them completely cool. Place in a bag or jar & set in a dark spot. Twice per day, shake the jar/bag. (This will allow any remaining moisture to distribute evenly among the items.) Look for ANY condensation on the bag/jar. If any is spotted, put the items back on the dh for a few hours. Rinse & repeat. Once you go a week to 10 days without any condensation found, they're ready for long-term storage. . .
Do you mean literally wash in water and dry again? No, no, no. Sorry! I was trying to be clever before I had my coffee... Always a bad idea, lol. "Rinse & repeat" like shampoo instructions, i.e. continue on the same as what you just did. I'm going to be moderating this thread to keep it tightly on track of dehydrating veggies. Marie will have other threads covering dehydrating other foods. Let's let her run with it unless clarification is needed. Thanks everyone. Wondering if zucchini would work with dehydrating. I have a dehydrator. I want to dice it and then dry it for future use in the winter and early spring. Have any of you done this? AM, Could you address various veggies that need processing, blanching, ice bath, drain and then dehydrate? Times for blanching and icing would be most helpful. Just a list with the times?? Thanks. GreatGRanny, I've not diced zucchini and then dehydrated it, however I do slice them thinly and dehydrate for use in soups, stews and Chili. @bluelacedredhead wrote: GreatGRanny, I've not diced zucchini and then dehydrated it, however I do slice them thinly and dehydrate for use in soups, stews and Chili. That was what I meant. I did try some but it isn't what I would like to do all the time. If I had a larger freezer, I would probably freeze it instead. Oh well, Fall is here and soon there will be nothing in my garden. Been out for several days... Sorry.... Yes, Sanderson, I'll get that list. I'll try to do it first thing tomorrow! This article has a good chart for blanching times. This article has a good chart for blanching times for freezing veggies. Does the same apply for dehydrating? I wish the instructions and chart came in a .pdf printable form. Some items are very unexpected! @trolleydriver wrote: This article has a good chart for blanching times for freezing veggies. Does the same apply for dehydrating? I've dehydrated a lot of veggies and fruit. I don't recall any mention of blanching with the exception of Cranberries which need to be boiled for 2 or 3 minutes until their skins burst. I don't blanch herbs. And I dh herbs at NO MORE than 95F. They lose their oils at temps higher than that. On veggies, they will rehydrate back to pretty much where you had them to start with.... If it's something like tomatoes, summer squash, cukes, I don't blanch. Celery, carrots, potatoes, yes, because I'll want to use in a soup or something. Blueberries, cherries, grapes, I blanch or poke holes in them. I know Yolos had some great success dhing basil in her microwave. Stayed REALLY green & pretty! There is a website with great info: www.21stcenturyliving.com And she has a fb page called dehyrating divas & dudes. 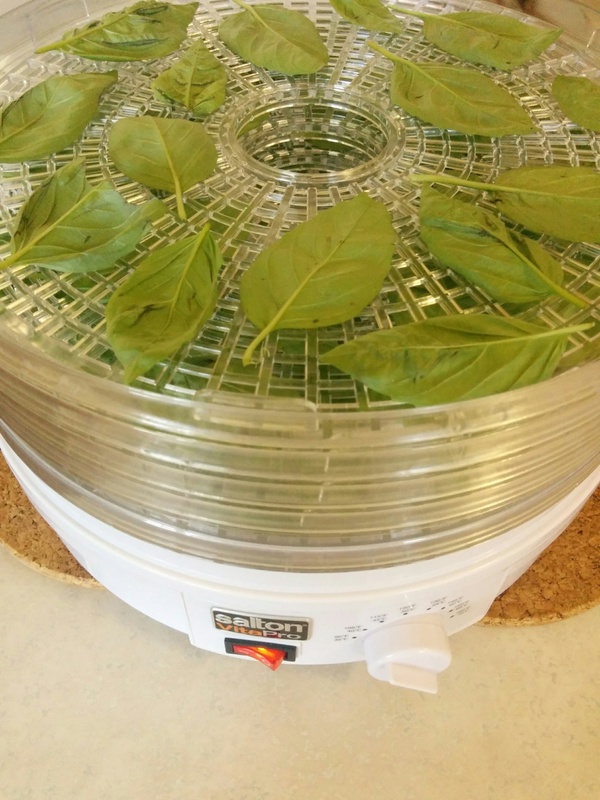 I have dried herbs in hanging bundles, in the outside dehydrating box/screened cage, in the microwave with paper towels (testing a few seconds at a time) and in the dehydrator. The microwave method does leave the herbs with their color.